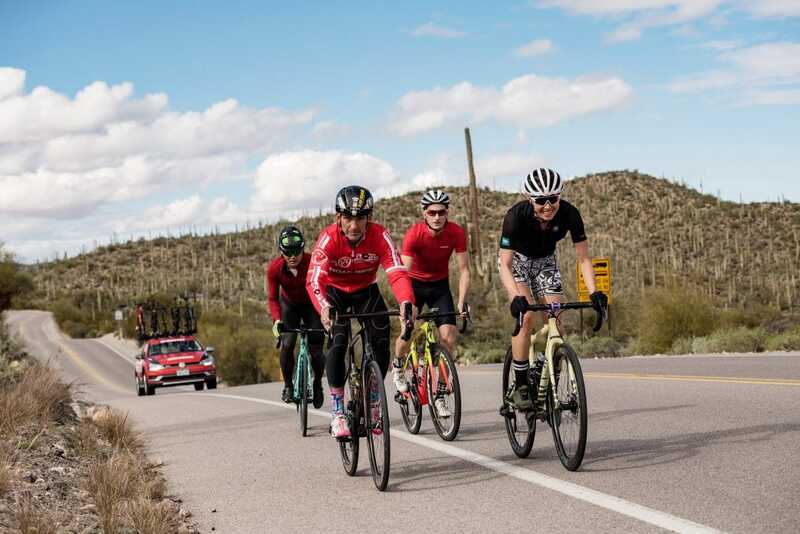 For this all important product launch, SRAM set-up camp at the massive & luxurious JW Marriot hotel located in the outskirts of Tucson, Arizona. In addition to the pozole served at the breakfast buffet, the Marriot was a good choice for its central location to some great (paved and gravel) roads. To handle two camps worth of ride hungry journos of every size and shape, SRAM partnered with over a dozen bike brands to supply enough bikes for everyone to ride. It was no doubt a grueling affair for the mechanics who not only had to build them, but also had to keep them all prepped in tip-top shape lest a derailleur should skip or a chain derail. A key component of the PR push was that all the bikes at the launch would be available to the public – RIGHT NOW – versus the more commonplace situation when actual production bikes and parts aren’t actually available for months following their initial public outing. The bikes here only represent a fraction of the models available, but they do represent the brands that are supposed to have SRAM eTap AXS spec’d bikes ready to buy as you finish reading this sentence. Here’s a way to find a list of official eTap AXS spec’d bikes. SRAM set-up a mini-city in a remote parking lot at the Marriot where the bikes were stored and serviced. In addition to all the service that took place at the hotel, SRAM mechanics were laden with team car duties to make sure all went well out on the open roads. A tip of the hat to all of SRAM’s mechanics, flunkies, and support staff who were up at dawn and then worked late into the nights while the journos were sucking down their fancy red wines and desserts.